A first place ribbon at the Quilt Show! Look at that winning smile! The past week or so has been jam packed. Larry and I went on a vacation — more on that later. My friend BJ came for a few days and we attended the Pennsylvania National Quilt Extravaganza at Oaks, PA. BJ is a master quilter and had entered one of her quilts in the Show. I felt very fortunate that I live close to Oaks so I got a nice visit with her. I went last year — without BJ — and did a post about it with a picture of her quilt with a ribbon. This year we went together, and, yes, another ribbon. I was not surprised because BJ is one good quilter. BJ retired a few years before I did and decided to pursue her love of fiber and become a professional quilter. Here is the quilt that won first prize for Best Interpretation of Theme, “Spiral Galaxy Number 3.” If you look back to the same time last year you will see her earlier quilt, Sky Horse that is in the same series of galaxy themed quilts. BJ makes “art quilts.” These may include some traditional patterns and themes, but are meant to be a piece of art, fiber art. For those of you who are used to quilts like grandma used to make, this is not your grandma’s quilt. Wait! There was a second surprise. As BJ was wandering around at the show, she came across one her quilts that had been traveling around the world. Coincidentally it happened to land in Oaks, PA at the same moment as BJ. Here are a few of my other favorites from the show. Below is a photo with detail of a corner of this quilt. Not a first place prize winner, but it had our vote. Look at how the quilter shows the reflection in the water, and the detail on the buildings. Another favorite. Like the one above, only an honorable mention. I would categorize this as a traditional quilt with a modern flair. The level of detail is incredible. Here is BJ looking at the sewing machines. No, she didn’t buy it. I won’t show photos of other first place ribbon winners. You can find them on the website here. We will have to wait until next year to see what BJ has in mind for her next masterpiece. 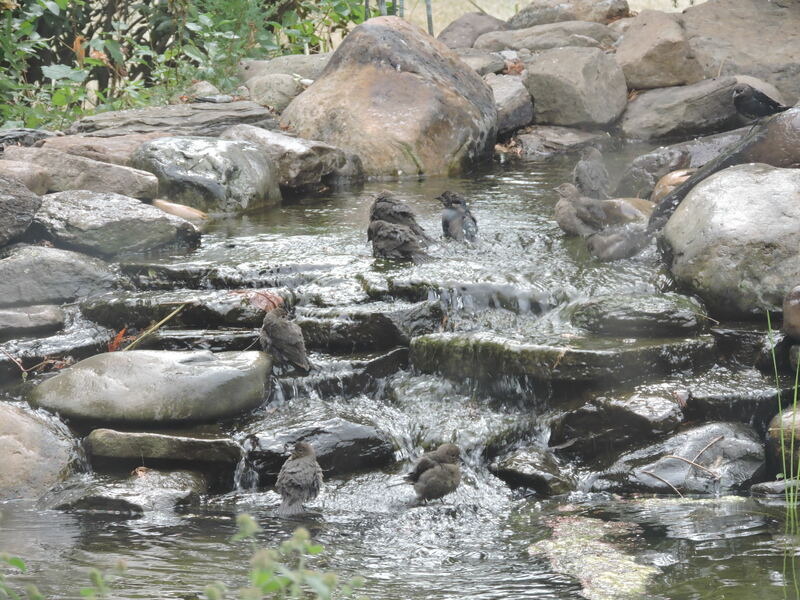 Until then I’ll leave you with this photo of birds bathing in my pond. A whole swarm of them came to wash yesterday and then all flew off together. ← When life slows down . . . I really had a wonderful time visiting you and thank you for highlighting my quilts. 😀 Isn’t that quilt by Linda Schmidt incredible? Hi BJ. It’s always a pleasure to visit with you and to bask in the glow of your quilts and the others we enjoyed at the show. Can’t wait to see what you create for next year!